But what about content strategy? Google “business case content strategy” and you’ll get only 72,000 results. Now, when I say, “content strategy,” I mean the holistic approach to using content as an asset to the business. Why should the business care about careful governance, management, adaptation, optimization, and scale of the way it uses content? What is the business case for organizing a centralized strategic approach around content as an overall business asset? Unlike the case of a content marketing strategy, here we have no real comparison. We can’t make the case that content strategy is more effective or efficient than doing something else. It’s not an alternative strategy. Rather, the comparison is to do nothing about organizing an activity – creating content – that the business isn’t already doing. 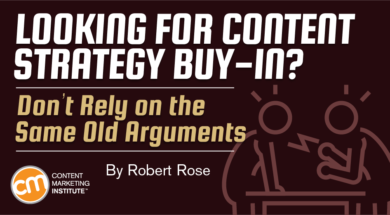 After looking up and reading through recommendations for making the business case for content strategy, I found that they tend to fall into one of three arguments. It’s already hurting your business. Not having a centralized method of creating, managing, and distributing content costs more, hurts revenue, impedes sales, or challenges your ability to effectively service customers. But, this argument is almost never universally true. And it’s also not mutually exclusive. The lack of a centralized approach could be costing the business, but a centralized process could slow things to a point where it hurts sales and revenue, and teams would move more slowly. It’s necessary for the future of customer experience. Scaling your content is necessary to feed all the digital channels that the enterprise is managing. Is it any wonder that this is the common argument from enterprise technology providers? It argues that to create better, more consistent experiences for your customers, you need a centralized content management strategy. But, the argument is self-defeating. It makes the case that all content and all customer experiences should be managed from one “brain.” It doesn’t address the real world of global differences, skill sets, talent, and technology prowess. Anyone who has had to create a nimble and agile approach to using an enterprise-class content management system to launch a simple blog will know how this argument can fall apart quickly. Organized is better than disorganized. Content is important (we all know that, right?) and thus having some form of organized approach for it (rather than chaos) is simply common sense. This might be the most common and certainly the simplest business case for a content strategy. But, you again run into the except-when-it’s-not cases. I worked with an organization earlier this year to implement an organized approach to its global digital content. The brand would create and manage all the content centrally and hand down “modules” of well-structured content to the regions. It mandated that the regions use these modules for everything they were creating. What the organization found was that for the content to be used by all the regions, accounting for local tastes, regulations, and brand maturity, it had to be extraordinarily vanilla. By the time the content was customized for local channels, translated, and localized into the regional languages, the content simply had no relation to any of the modules created. Now, to be clear, all three arguments can be sufficient in the right situation. And I’m the first to admit that each of them has more nuance than I’m giving here. But they all have weaknesses that I’ve personally seen fail in the real-world politics of the business. What is a more foundational argument for content strategy? How can you make the case to the C-suite and mollify skeptical colleagues in other departments? Why does a centralized content strategy make sense? It turns out we are trying to answer the wrong question. We are trying to solve for a centralized means of creating and managing content. So, we start from the premise that we need to move the creation and production of content to the limited few who can actually govern that process effectively. Instead, we need to ask, how we can create a process that moves the creation of content as close to each and every customer experience as possible. A great content strategy enables a balance between the need for enterprise consistency, efficiency, and scale, while enabling the creation of content to be as close to the customer experience as possible. From a marketing and communications perspective, we built strategies around the creation of content for whatever part of the product life cycle we were in charge of. Product marketing/management created the packaging content for the product. Integrated marketing teams developed the positioning content of the product. The advertising and promotion teams created the promotional content for the product. Sales often created the pitches and other materials needed to sell the product. And, finally, customer service often created content to help customers learn how to better use the product. Yes, now the customer experience is integrated across channels, and must be made wholly consistent from the customer’s point of view. But don’t we need the ability to customize and personalize content for new markets and personas across product segments? Yes, now the content must scale to the new and disparate digital channels that emerge daily, and we must be reactive to the new expectations of customers who expect instant access to consistent experiences. But aren’t we concerned a centralized approach can encourage the brand to become vanilla and undifferentiated when content is created from a common source? Yes, now we must be more organized and considered with the huge amount of content we are creating. But what about all those exceptions where it would be better to create one-off content? In my experience, we are trying to centralize the wrong thing. Most enterprises believe creating a content strategy is about centralizing the creation of content for use as a reusable widget across the enterprise. That view looks at content as a factory output – and seeks to argue for a business case to create a scalable, automated, and consistent moving assembly line. That thinking is where the case for centralization trips up. Instead, the question should be: How can the business create a strategy to ensure that content – independent of where it is created, managed, and promoted – serves the enterprise as a strategic asset? The better argument for content strategy should be that it creates a process that can move the creation of content as close to the customer as possible. It’s the only way to balance enterprise scalability, and a consistency in brand, customer experience, and effectiveness, while moving the creation of content as close to the customer as possible. A great content strategy doesn’t limit where content creation happens. It seeks to ensure that wherever content creation happens it is as close to the customer experience as possible. Strategizing around the customer requires creating foundational education, governance, workflows, measurement, and, yes, technology, to create multiple wellsprings of content. It should be created centrally, where applicable; locally, where needed; and it should use separate technology, when warranted. Great content strategies aren’t occupying militaries, they are well-oiled governments allowing local economies to flourish. The next time you think about building that business case for enterprise content strategy, look to enabling these economies. This is what inspires our constituents to follow our lead. Learn more about how to create a customer-focused content strategy at this year’s Intelligent Content Conference March 20-22 in Las Vegas. Register today.